This pack contains 1 copy of Introduction to Hospitality, Global Edition + 1 printed access card to MyLab Hospitality with eText. Introduction to Hospitality, 7th Edition, focuses on hospitality operations while offering a broad, comprehensive view of the world’s largest industry. The text is organised into four sections: hospitality and lodging; beverages, restaurants, and managed services; tourism, recreation, attractions, clubs, and gaming; and assemblies, events, attractions, leadership, and management. Each section includes real-world profiles, first-hand accounts, and engaging case studies to help readers connect with the material and foster an appreciation of the industry’s unique enthusiasm and passion. New photos, page layouts, and hands-on examples help students understand the how-to aspects of today’s hospitality industry. Updated to reflect today’s trends and realities, the 7th Edition contains new coverage of spas, updated and new corporate profiles, salary information, hospitality-related technologies, and more! 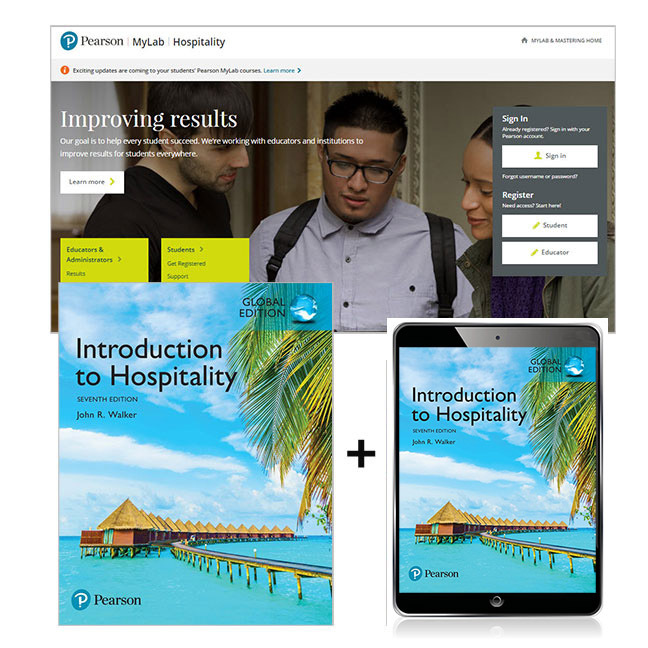 MyLab Hospitality is an online homework, tutorial, and assessment program designed to work with this text to engage students and improve results. Within its structured environment, students practice what they learn, test their understanding, and pursue a personalised study plan that helps them better absorb course material and understand difficult concepts. To help students explore the hospitality industry, MyLab Hospitality includes industry-specific simulations from Hospitality & Tourism Interactive (HTi), and real case studies written by industry leaders. MyLab Hospitality is not a self-paced technology and should only be purchased when required by an instructor. The duration of access to MyLab Hospitality is set by your instructor for your specific unit of study.